Latest Report Modern Machine Shop 81 unusual: The last time this occurred was 2011. That year, all of the top 15 countries that con- sume machine tools increased consumption—the only time that has ever happened. However, the industry was then in the midst of a rapid recovery from the Great Recession of 2007. Since 1980, only six years saw more than 12 of the top 15 increase consumption. Before 1980, no single year showed that level of growth. At the moment, I do not think the strength of the top 15 consuming countries will decline in 2018. We can make a rough estimate of machine tool consumption in a country by analyzing the trends in its money supply, industrial production and capacity utilization. This analysis indicates that it is quite possible for 13 of the top 15 coun- tries that consume machine tools to increase consumption in 2018. 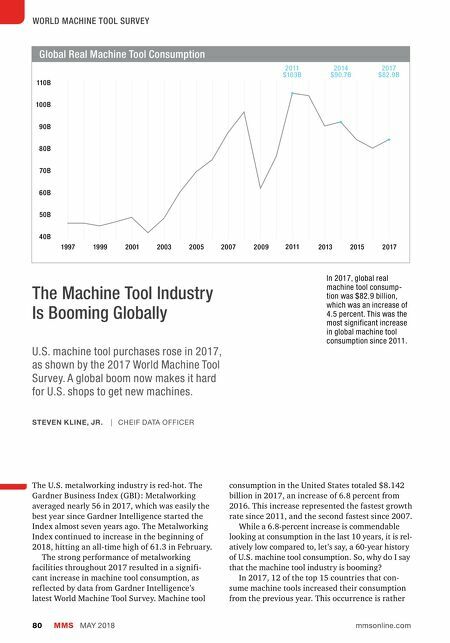 Indeed, the machine tool industry is booming, but not based solely on United States doing well. Rather, it is because almost all major manufactur- ing countries around the world are doing well. Perhaps most importantly, China raised its 2017 machine tool consumption by $1.780 billion to $29.970 billion, an increase of 6.3 percent. 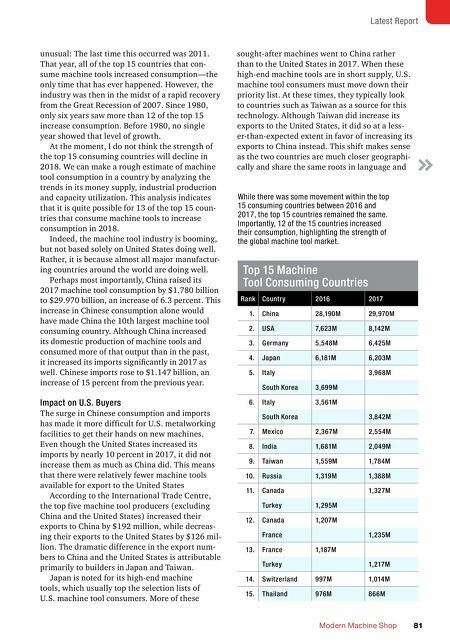 This increase in Chinese consumption alone would have made China the 10th largest machine tool consuming country. Although China increased its domestic production of machine tools and consumed more of that output than in the past, it increased its imports significantly in 2017 as well. Chinese imports rose to $1.147 billion, an increase of 15 percent from the previous year. Impact on U.S. Buyers The surge in Chinese consumption and imports has made it more difficult for U.S. metalworking facilities to get their hands on new machines. Even though the United States increased its imports by nearly 10 percent in 2017, it did not increase them as much as China did. This means that there were relatively fewer machine tools available for export to the United States According to the International Trade Centre, the top five machine tool producers (excluding China and the United States) increased their exports to China by $192 million, while decreas- ing their exports to the United States by $126 mil- lion. The dramatic difference in the export num- bers to China and the United States is attributable primarily to builders in Japan and Taiwan. Japan is noted for its high-end machine tools, which usually top the selection lists of U.S. machine tool consumers. More of these sought-after machines went to China rather than to the United States in 2017. When these high-end machine tools are in short supply, U.S. machine tool consumers must move down their priority list. At these times, they typically look to countries such as Taiwan as a source for this technology. Although Taiwan did increase its exports to the United States, it did so at a less- er-than-expected extent in favor of increasing its exports to China instead. This shift makes sense as the two countries are much closer geographi- cally and share the same roots in language and Top 15 Machine Tool Consuming Countries Rank Country 2016 2017 1. China 28,190M 29,970M 2. USA 7,623M 8,142M 3. Germany 5,548M 6,425M 4. Japan 6,181M 6,203M 5. Italy 3,968M South Korea 3,699M 6. Italy 3,561M South Korea 3,842M 7. Mexico 2,367M 2,554M 8. India 1,681M 2,049M 9. Taiwan 1,559M 1,784M 10. Russia 1,319M 1,388M 11. Canada 1,327M Turkey 1,295M 12. Canada 1,207M France 1,235M 13. France 1,187M Turkey 1,217M 14. Switzerland 997M 1,014M 15. Thailand 976M 866M While there was some movement within the top 15 consuming countries between 2016 and 2017, the top 15 countries remained the same. Importantly, 12 of the 15 countries increased their consumption, highlighting the strength of the global machine tool market.